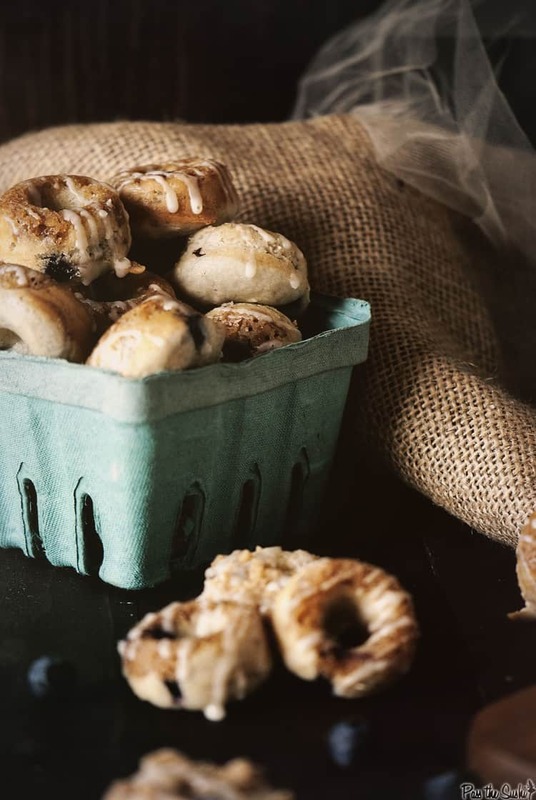 These Mini Blueberry Donuts with Streusel topping are perfect for satisfying your donut craving, without leaving a cement weight in your gut. Let’s have a little chat about etiquette. Internet etiquette that is. Last week it was brought to my attention that one of my photos, along with the entire recipe was posted to a facebook page that wasn’t mine. It’s the internet. It was built to share information quickly. It was a recipe. I post recipes on the internet because I want people to try them. But copying and pasting an entire post to your own page without and credit is just plain wrong. Sadly, these sort of pages are springing up everywhere and the people who follow them feel that they are perfectly right in what they are doing (and have been downright mean to food bloggers – you know the people providing them with the content they are stealing). For instance, the recipe below is not my own. I did not create it and I don’t claim to. I’ve adapted it, put it in my own words and I include credit on every post directly below the title of the recipe and when applicable, a link to the original source. If I claimed this recipe as my own, you would accuse me of stealing it. And that would be wrong. 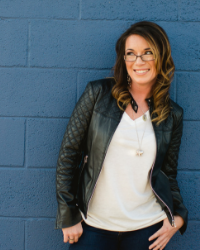 Do I want my posts shared – heck yeah! A snippet and link back to my site on your facebook page, freakin sweet! Want to hit the print this button and make 35 copies for your co-workers to take home – boom diggity! That was like handing out 35 business cards – except you could lick them! Pin, tweet, and google plus away. But please don’t try to jam the entire recipe into that post along with one of my photos. Not cool. I know it’s just a food blog, and those are a dime a dozen these days. But I create the food from scratch. Their is no magic editing, no savvy tricks, fake cheese, glue, or editor. It’s me and my camera. Which takes time. I make the food, snap the photos, edit the pics, and write the posts. It’s not my day job, and it doesn’t exactly pay the bills, but please respect it. See, the money I make from this site does not come from Facebook or Pinterest. It only comes from actual clicks on this site. And its literally fractions of a penny to the thousand. When there is no need to click back to the site, you are taking bread off of my table, and future posts off of this blog. 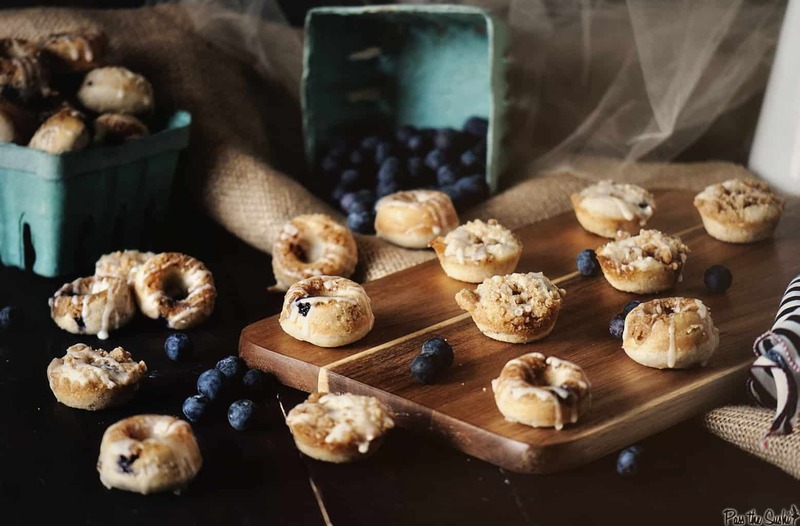 Like these Blueberry Donuts with Streusel topping. Less to drool over. Tragic right? Moral of the story? Share with care ;D Yeah, I just went all Sesame Street on you. 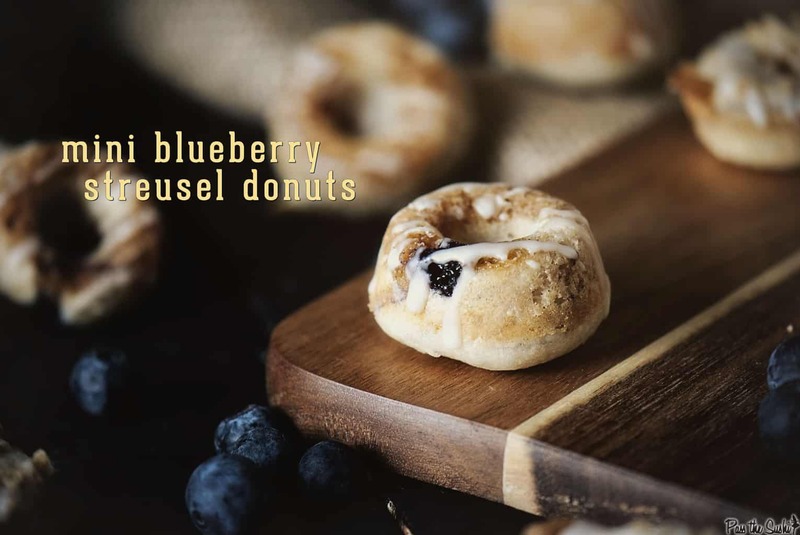 If you’ve tried this Baked Mini Blueberry Donuts with Streusel Topping recipe, or any other recipe on passthesushi.com please don’t forget to rate the recipe and let me know where you found it in the comments below. I love hearing from you! You can also follow along for more good eats and travel tips on Instagram @passthesushi & @girlcarnivore, Twitter & Facebook. Preheat the oven to 350 degrees F. Grease a mini donut pan. Whisk the flour (reserving 1 tbs), baking powder, and salt in a large bowl. In another bowl combine the egg and sugar until pale yellow. Add the oil, sour cream, vanilla, and milk. Gently fold wet ingredients into the dry ingredients until everything is just moist and no lumps. Toss the blueberries in the reserved 1 tbsp of flour. Fold into the batter. With a fork, stir together the streusel topping ingredients. Sprinkle a little into each donut area of the greased pan. Snip off the corner of the ziplock bag of dough, and fill each donut area half full. Cool on wire rack for 5 minutes before flipping pan and turning out donuts to cool completely on a wire rack. Whisk together the milk, vanilla and confectioners' sugar. When donuts have cooled and are still on wire rack, place wax paper under the rack to catch drips. Drizzle glaze over the donuts. Let sit for 5 minutes to set. Looking for more Donuts? Try these recipes out! Discussion of attribution on the internet is something I’ve been reading a LOT about over the last year; it’s definitely a problem that all content providers, food bloggers and otherwise, run into on a regular basis. It drives me nuts seeing people blatantly crop out watermarks, or straight-up copy-paste words and images from a blog like yours where you’ve clearly gone through so much work (and it drives me nuts how little these people seem to care). I don’t know what the solution is, but educating people on what is and isn’t okay when it comes to sharing content is definitely a start. Very well put. Sesame Street always has good morals, too bad some people don’t follow that little motto. But anyway, these little guys look great! These are so cute and delicious looking! Why is it that mini things are always so cute! These are absolutely adorable! Love all that fresh blueberry flavor. Thanks for sharing! The bummer is that I agree wholeheartedly with what you wrote, but it’s hard not to think that it more an exercise in you getting if off your chest than any chance that it will do any good. Very disheartening. The donuts on the other hand, yowza. They look amazing. Very well said, Kita… I couldn’t agree with you more! Now, please pass me a donut! oh these looks so stunning and so very neatly shaped. Hey Kita, I know what mean, I’ve seen mine on Pinterest too and it does let the air out of your ballon. I think for the most part people who don’t have blogs don’t know it’s wrong but then there are those that do know but don’t care. Good post and your mini donuts look yummy!! So, I’m just saying that I agree with everything in this post…including the need for delicious donuts. Streusel on a donut?! YUM!! Ah, these are lovely 🙂 they look so delicious! Preach it, Sista! These donuts look amazing. Mini means I get to eat more, right? How did I miss these? I’ve never had a streusel doughnut but I think it’s about time I do. The same thing has happened to me a few times too! It’s so frustrating right? Some people are just uncreative thieving little jerks! Love these mini donuts! Yummy! these sound delish and are so cute! 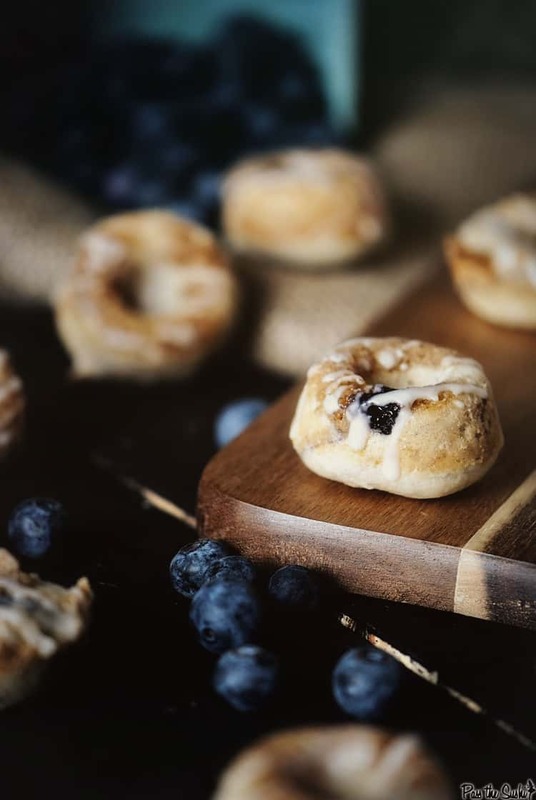 These Mini Blueberry Streusel Donuts are so cute,delicious mini bite! Glazed, streusal & blueberry … all in/on a doughnut. Fantastic!